- Stopping the vehicle on the railway track. - Carrying passengers in the vehicle more than limit mentioned in the Istimara(Vehicle registration card). - Fail to wear helmet while using motor cycle. - Seizing the Istimara or driving license of another person or using it on mortgage. - Overtaking the school bus while the students are getting off or getting in the bus. - Failed to stop the vehicles at the check points when security officials asked. - Using accessories of emergency vehicles or any official vehicles. - Using obscene stickers or posters which are against public behavior in the society. - Attempt to cover or destroy the features of vehicle. 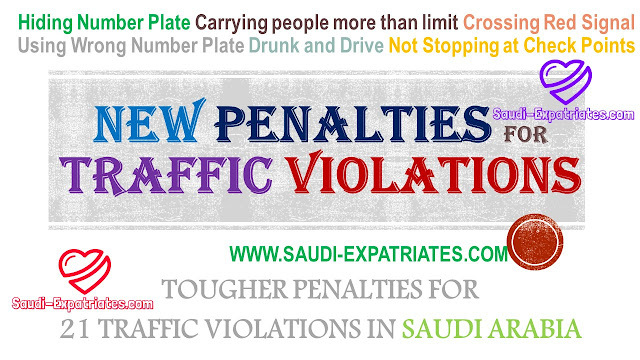 - carrying any activities on the road without proper permission from the concerned authorities. - Fail to stop at the accident involved case and fail to inform the concerned department and provide possible help for the injured.